Q: Do they need to be refrigerated? A: Primal Probiotics uses acid- and bile-resistant strains that survive through stomach acid and need not be refrigerated (although you CAN store them in a refrigerator). These strains have been isolated over years of research to resist digestion and more effectively repopulate intestinal flora. Many common probiotic blends can’t survive the acidic environment of the stomach. That’s why some companies use “enteric coatings” or special treatments to keep them inside a waxy ball until after they’ve passed the stomach. Perhaps you’ve heard that some probiotics also need to be refrigerated in order to remain “live.” In both cases, the main issue is that the strains they’ve chosen are not particularly hardy strains, to begin with. Q: How many pills should I take per day? A: Take 1 capsule per day, before or during meals. We recommend consulting with your Primary Care Physician for more insight into your individual needs. Q: Why are there only 10 billion colony forming units when other products brag about having as many as 30 billion? A: When other products claim to offer 18 to 30 billion CFUs, they are doing so knowing that most of the bacteria they deliver are common live strains found in many of the fermented foods we eat and that they will be dead in the bottle only a few weeks after manufacture. 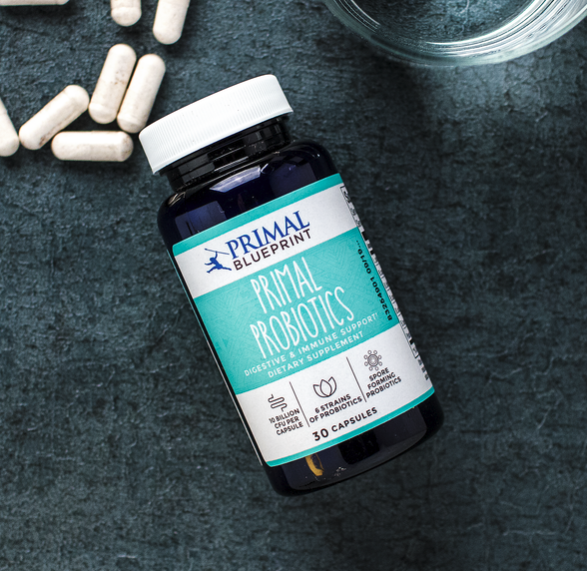 Primal Probiotics uses a proprietary blend of special spore-forming bacteria that can survive in a dormant state for long periods of time, as well as survive the harsh, acidic environment of the stomach and bile in the upper part of the small intestine. Moreover, we use a special digestion-resistant capsule designed to disintegrate lower down the digestive tract. The net effect is that most of the healthy probiotic strains in Primal Probiotics are delivered to their destination ready to work for you. Q: What exactly are excipients and do you use them in your products? It's a very broad term that describes what can be added to a formulation to make it flow easier, to bind it together, to add texture, color etc. Some are bad, some benign and some are beneficial. For example, we use potato starch as an "excipient" in our probiotic formula. It helps fill up the capsules but also serves as a source of resistant starch to feed the good bacteria. Magnesium Stearate is also a known excipient and is a very common ingredient in capsules as it tends to help coat them and make them easier to swallow. It also enhances the effect of the active ingredients and promotes absorption. Q: Is the potato starch in the Probiotics raw? A: The raw material is not pre-cooked but the finished material is dried in a tumbler oven. Q: Are the Probiotics egg and dairy free? A: In the current formula, the majority of the probiotics are not derived from allergens, with the exception of one strain that is derived from a dairy source. The end product of this strain is not considered an allergen because, theoretically, all of the fermentation nutrients are consumed during fermentation, and after fermentation, the product is further separated/ purified. If you have a severe dairy allergy, then you could say there is potential for very trace amounts of milk protein, but for labeling purposes, it is not considered to have any allergens. Q: What testing has been done on your Probiotics? Q: What makes Primal Probiotics unique among all Probiotics? A: Because Primal Probiotics is made up of several "spore-forming" versions that are designed to survive the harsh environment of the stomach and remain viable in the lower intestines, we only offer a billion or two of each strain (10 billion total) per capsule, making this product 10 to 20 times as potent as regular store-bought probiotics! They mimic the healthy bacteria that we would find in the soil if we were eating dirt with every bite, just like our primal ancestors did. And we sealed these microorganisms in specially designed capsules that don't dissolve in the acidic stomach environment. The first four strains in Primal Probiotics are from the order Bacilli. Abundantly living in the environment, water, air, and soil, they are also fixtures in the guts of insects, invertebrates, birds, aquatic life, animals, and humans. In artisanally crafted foods and beverages that are prepared by long fermentation, these Bacilli strains play key roles in halting spoilage and inhibiting pathogens such as opportunistic molds, Escherichia coli, Salmonella, Staphylococcus, Shigella, and Yersinia. When taken as part of a probiotic supplement, they aid our guts in the very same way. Bacillus subtilis is shown to be extremely efficacious for GI infections, decreasing upper respiratory infections and preventing dysbiosis and diarrhea during antibiotic therapy. This strain aids digestion by helping to break down and assimilate fats, proteins, and starches in our food. Bacillus subtilis also releases enzymes that help aid hydrolysis of allergenic proteins like gluten, lactose, cellulose, mycotoxins, antinutrients, phenols, and tannins, as well as enzymes that break down harmful bacteria, molds, yeasts and aflatoxins. Bacillus clausii is used in Italy and Europe extensively for acute diarrhea, dysbiosis, prevention of antibiotic­-related diarrhea, allergic rhinitis and irritable bowel syndrome. It’s a protective bacterial strain with the power to boost our innate immune defenses. Bacillus clausii has been used successfully to reduce diarrhea and protect native gut flora in infants and children, and also appears to take action against pathogens that frequently are associated with inflammation, obesity and digestive problems, such as Staphylococcus and Clostridium difficile. A recent study showed that Bacillus clausii triggered a significant reversal of small intestinal bowel overgrowth (SIBO). Another study showed that Bacillus clausii shortened recurrent respiratory infections in children, and provided lasting protection for up to three months after discontinuation. Lactobacillus plantarum (LM Strain) is one of the most consumed probiotics since humans started fermenting beverages and foods hundreds of thousands of years ago. It’s also one of the commensal species regularly isolated from healthy human mucosa; however, in modern guts, it’s commonly missing. Lactobacillus plantarum has been found to reduce abdominal pain and digestive distress by eliminating harmful gas­-producing microbes from the gut. Lactobacillus plantarum magnifies mucus secretion, thereby protecting the gut, and actively expels pathogens like E. coli, Staphylococcus, Salmonella, Enterobacter and Pseudomonas that are associated with inflammation, obesity, wounds, heartburn, digestive problems and other conditions. Lactobacillus plantarum may also support our digestion by helping to break down gluten and lactose, as well as by making vital nutrients, antioxidants, and folates. Along with Bifidobacteria (see below), lactobacilli convert dietary lipids into fat-burning antioxidants known as conjugated linoleic acids (CLA) that help to lower body fat and increase lean mass. According to the clinical studies conducted thus far, no other probiotic shields immunity or reduces the duration and incidence of viral infections, respiratory tract infections, colds/flu, urinary bladder infections, Helicobacter pylori overgrowths, Candida infections, and vaginosis as effectively as L. plantarum. Bifidobacteria bifidus (also referred to as B. bifidum) is one of our most specialized human gut residents. It acts like your gut’s bouncer, keeping out all unsavory and sly characters! As one of the principally studied probiotics in the last decade, Bifidobacteria bifidus has been found to protect against dysbiosis, acute diarrhea and antibiotic-induced diarrhea in babies, children, and adults. Combined with lactobacilli, Bifidobacteria bifidus has been associated with replenishment of normal flora after potent antibiotics, decreases in winter infections in children and improvements of HDL cholesterol and blood sugars. In new microbiota research, high levels of Lactobacillus plantarum and total Bifidobacteria were directly correlated with leanness and insulin sensitivity. Unfortunately, Bifidobacteria bifidus is often one of the first casualties after just a single round of antibiotics, which is why probiotic supplementation is so important. Saccharomyces boulardii has been France’s probiotic strain of choice against diarrhea since the 1950s, and it has a long history of use in folk medicine for healing all digestive ailments, including infectious diarrhea. Saccharomyces boulardii can survive extreme conditions and provides potent defense against a wide range of harmful gut threats and their toxins: pathogenic Candida, Entamoeba histolytica, Giardia lamblia, Vibrio cholera, enterotoxic E. coli, Salmonella, Clostridium difficile and other bacteria. Used successfully in maintaining native gut flora during antibiotic treatment, S. boulardii may often be recommended by physicians and pharmacists to be taken with antibiotics to prevent dysbiosis and recurrences or colonization of Clostridium difficile. Saccharomyces boulardii has also been shown to treat gastroenteritis in children and adults, extend remission of Crohn’s disease and improve irritable bowel syndrome.